This article applies to macOS only. Install the global command line tools for Xcode. Configure LLDB - the Apple supplied (and signed) debugger from within Lazarus. Note : if installing versions of Lazarus prior to 2.0.0 you almost certainly also need gdb, see in the Legacy section. 1.1 Step 1. Download Xcode. The detailed instructions assume a recent version of macOS on you Mac, a recent version of Xcode from Apple and recent version of Lazarus. Further down the page, under Legacy Documentation, you will see older information that may be relevant if you are using older components. You can assist by replacing out of date info, either deleting it, or, if it may help someone working with a legacy project, moving it to the bottom of the page. In general, this is about using both the Carbon and Cocoa Widget Set. While Carbon may still be seen as a little more stable, as of release 2.0.0 the 64bit Cocoa is very close and certainly should be considered. Carbon is intentionally (by Apple) limited to 32 bits and we know the next release of MacOSX will probably not support it. Get and install FPC and FPC Source. A compatible fpc (and source) must be installed before you install Lazarus, you have a number of options. Get release version from Link https://sourceforge.net/projects/lazarus/files . These binary install kits are built by the FPC/Lazarus developers and track formal releases. As these install kits are not approved by Apple, you need to hold down the Control key, click the package and choose Open and confirm you want to install from an Unknown Developer (i.e. one who does not pay Apple a kickback). You will be asked, whether to install a number of dependencies, including the FreePascal compiler, the lazarus sources. Simply hit RETURN at the prompt and go for a coffee. It may take quite some time to build all packages, in particular on older Macs. carbon (Aqua), gtk2, qt4 (Aqua), qt5 (Aqua), nogui, win32, win64 and wince. If you install fpc from fink, you will be fine downloading Lazarus source and compiling as detailed below. However, its possibly not a good idea to mix fink fpc with the sourceforge binary install of Lazarus. You almost certainly need to target Cocoa, its likely the next release of MacOSX will not support 32bit Carbon. You almost certainly want to use lldb instead of gdb - far easier install. The Cocoa is steadily improving and lldb interface is rapidly improving since even 2.0.0. Fixes_2_0 is a safer and more stable than trunk but gets the new stuff much faster than release version. Precompiled binaries based on fixes_2_0 are not available from SourceForge but can be obtained from fpcupdeluxe . But here we will discuss downloading source and building. An little slow initially but very reliable and a great test of your compiler install ! You will need svn (its not pre installed on early MacOS, use brew or fink to install). Note I pass a parameter to use a config directory thats based on the name of the actual install directory. It makes some scripting easy. Its also quite feasible at present (and perhaps a touch safer) to build a 32bit Carbon Lazarus IDE and use it to build 64bit Cocoa applications. Replace above make line with "make LCL_PLATFORM=carbon CPU_TARGET=i386 bigide " and setup your project as mentioned in the Carbon_and_Cocoa section below. In versions of Lazarus 1.8.4 and earlier, you needed to use gdb as a debugger, slow to install and hard to sign. Since Lazarus 2.0.0 you can (and should) use LLDB, a debugger provided by Apple, no signing required. Assuming you have installed whats necessary and started Lazarus, all that remains is configuring the debugger. If you don't do this now, Lazarus will try to use GDB and fail. First, click Tools->Options->Debugger. Top right of the window now open has a label, "Debugger type and path", you must set both. Select "LLDB debugger (with fpdebug) (Beta)". Martin_fr, the person who has given us this interface between Lazarus and LLDB, suggests you use "dwarf3". Then, you need to enter your password, a MacOSX cuteness because one application appears to be interfering with another. In this case, thats fine ! In the unexpected case of problems, it may be worth trying "dwarf with sets" instead of just "dwarf3". If you change settings for package, you may as well check into which package you expect to step. Package you do not step into, do not need debug info. If you use a type from a package (such as TForm from LCL) it is enough that your unit (in which you declare the variable / must declare and use a variable to include the type) has debug info. Reducing the amount of packages with debug info (including those that default to have debug info), can shorten the debuggers start-up time. If you installed from source and used the bigide parameter to make, then the correct debugger will be installed, as a package, and ready to go. If, however, you installed in another way, it may, or may not be there. From the main IDE screen, click Packages->Install/UninstallPackages. Show is two lists of packages, the list on the left is installed, the list on the right is available to install. Look for LazDebuggerFpLldb (exactly that, there are some similar named but less suitable packages). If its on the right hand side, click it, press "Install Selection" and then "Save and rebuild IDE". This will take a little time, the IDE will shutdown and restart and all should be well. Now jump back up the page and continue configuring the debugger. At present (early 2019) Lazarus using Cocoa will meet many users needs. Carbon work pretty much as expected but you are advised to try Cocoa first, especially considering that Apple has indicated releases after Mojave will not support 32bit Carbon. Alternatives include QT and GTK2+, both requiring additional libraries and GTK2+ on the Mac appears to get little attention these days. QT on the Mac does have some strong supporters on the forum. In the "Config and Target" panel set the "Target CPU family" to be "x86_64"
In the "Additions and Overrides" panel click on "Set LCLWidgetType" pulldown and set the value to "Cocoa"
In the past, for some reason Lazarus kept setting the compiler to "/usr/local/bin/ppc386" - which results in 32 bit apps. Make sure under Tools->Options that "Compiler Executable" is set to "/usr/local/bin/fpc" to get 64 bit apps. Now compile your project - and please feed back any problems you experience. 10.5 and higher already contains svn clients. Users of earlier versions must install SVN for macOS. A good package is provided by Martin Ott. You can also use fink. SVN clients with GUI (graphical user interface) are available from Versiontracker. A quite handy client, which integrates in Finder, is SCPlugin. and <return> again. Subsequently, FreePascal will use the makefile in this folder to build the Lazarus IDE. This may take a few minutes, but the process is fully automated. Therefore, you might want to look for a cup of coffee, while FPC is working. If the compiler is ready it prints the number of processed lines and the required time to the shell's output. The last step is to right-klick on the Lazarus bundle icon and to select "Show Package Contents" from the context menu. Then drag the executable "lazarus" to the folder "Contents/MacOS" of the bundle. That's it. Getting gdb to run can be a bit tedious but is worthwhile in the end if using Lazarus < V2.0 or have some specific requirement for gdb. You probably don't ! This step should be done after installing XCode and before installing FPC/Lazarus. Self sign the gdb binary using tools already on your Mac - https://sourceware.org/gdb/wiki/BuildingOnDarwin This is the tedious part. The instructions are clear except, perhaps they could have mentioned that after you have set the Keychain to ’System’ you need click ‘Create’ and ‘Done’ on the next screen. Then go and find the cert in your overall list of certs to do the next instruction “using the contextual menu…”. Don’t worry about step “2.1.4 Disable starting the debuggee…”, we’ll address that once Lazarus itself is installed and working. Once Lazarus is installed and fired up, tell it how it should start gdb, that is step 5. Note that as of April 2018, there may be issues with newest gdb and High Sierra. https://forum.lazarus.freepascal.org/index.php/topic,40874.0.html According to https://stackoverflow.com/questions/49001329/gdb-doesnt-work-on-macos-high-sierra-10-13-3, gdb 8.1 does not work on High Sierra, but 8.0.1 does. Again, this step is not necessary with Lazarus V2.0 and Later. See http://wiki.lazarus.freepascal.org/Lazarus_2.0.0_release_notes#LLDB_based_Debugger_.28New.29 If you do install (and use) gdb, you must tell Lazarus about how to call gdb. Obviously, this step happens after Lazarus is installed. OK, now you should be able to start Lazarus, it should display the various parts and paths it needs (including gdb) in the little opening screen. You will get an alert there if you chose to not use a debugger. Proceed to the IDE and we now need to tell Lazarus to tell gdb to not open a shell, as noted by a number of Forum people (http://forum.lazarus.freepascal.org/index.php/topic,37310.0.html). Within Lazarus, click Tools->Options->Debugger->General In the “Debugger specific Options” there is a field labeled Debugger_Startup_Options. Type in "--eval-command=set startup-with-shell off" (including the inverted commas) AND press the return key, click OK. Note you cannot copy and paste into this box (##$!). See screen shot. 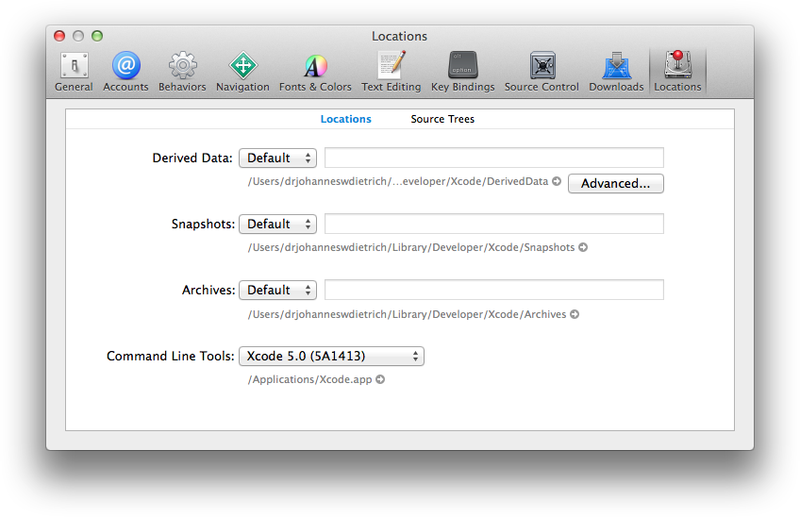 Default location of command line tools in Xcode 5. 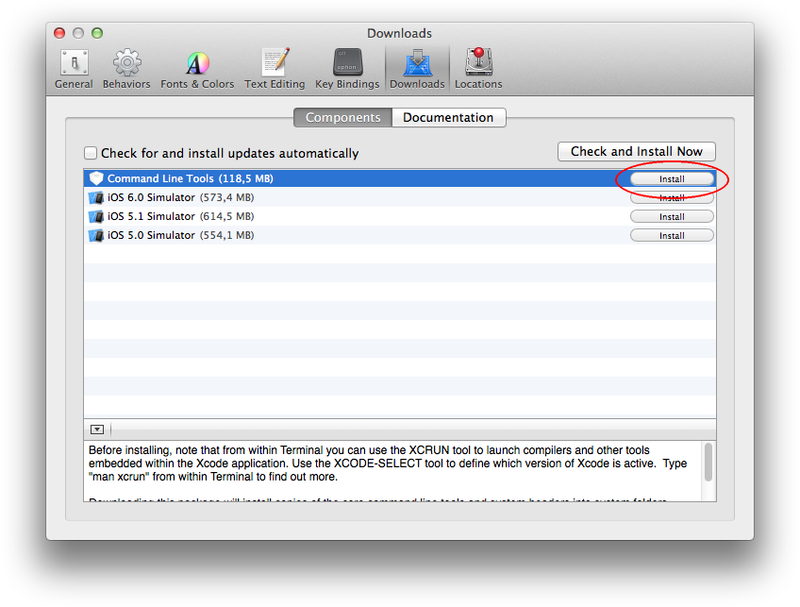 Depending from your Xcode version alternative steps to install the command line developer tools may be to download them directly in the Xcode preferences window (see screenshots above) or to download them from developer.apple.com (please take care to install the command line tools that are correct exactly for your Xcode version). You can compile and install the normal gdb. See GDB on OS X Mavericks and Xcode 5. 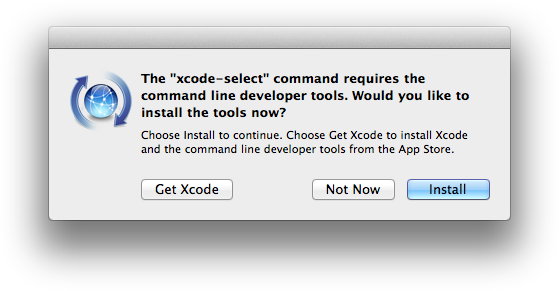 Xcode 4.3 and later no longer install the command line tools by default. These are required by FPC/Lazarus. 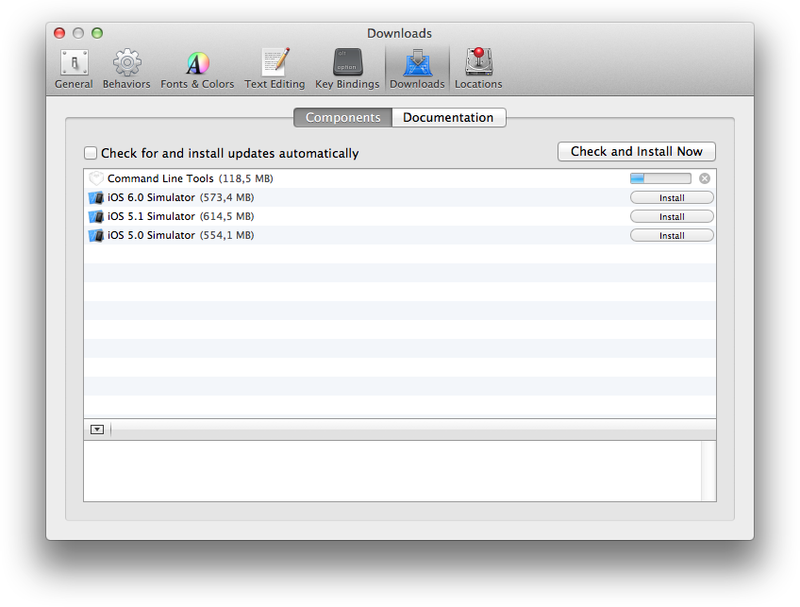 To install them manually, open Xcode, go to Preferences, select "Downloads;" and install the "Command Line Tools". Afterwards, FPC will install and function correctly. It will be necessary to reinstall the command line tools after each upgrade of Xcode (especially when it's a new major version, the installer may delete the old copies of the command line tools), and also after switching to a new major version of the system software (idem). You may also download the command line tools from Apple Developer. FPC 2.6.0: there is an issue when compiling dynamic libraries with FPC under Mac OS X 10.6 due to a bug in the Xcode 3.2.x linker. This bug has been fixed in Xcode 4. You can work around the bug in Xcode 3.2.x by using the -k-no_order_inits command line parameter when compiling a dynamic library. Most versions of Lazarus and FPC are compatible with Xcode 3.1 (see the compatibility matrix for detailed reference). The Xcode integration kit is provided as an optional install to allow for developing with Free Pascal directly from Xcode. It is not required for development with Lazarus, however. Most versions of Lazarus and FPC are compatible with Xcode 2.3 or newer (see the compatibility matrix for detailled reference). The Xcode integration kit is provided as an optional install to allow for developing with Free Pascal directly from Xcode. It is not required for development with Lazarus, however. Xcode 2.0 was compatible with Lazarus 0.9.x, but it is no longer supported by newer versions of the Lazarus IDE. After installation the Lazarus application can be found in /Developer/lazarus/, the FPC source files in /usr/local/share/fpcsrc. Note - different versions of Lazarus depend on particular versions of the FreePascal compiler and will not work with other versions. Another common problem is that the versions of fpc and fpcsrc are different. This is the easiest way to install Lazarus on Mac OS X. You need the latest stable released FPC installed in order to compile the development version. There are two development versions of the compiler: 2.6.x is stable version without new features - only bug fixes. The unstable version 2.7.x comes with lots of new features but sometimes also with bugs. Best is to download and install fpc 2.6.x. Some daily snapshots can be found here. Keep in mind that these are daily snapshots and that you can have bad luck and get a buggy version. The probability is about 1:30. So if the version is buggy try another day or use the released packages instead. For the removal of the Lazarus preference folder and files in your home directory, see below ( Lazarus preference folder). Normally you uninstall an application on OS X simply by dragging it from the Applications folder to the trash. But because Lazarus and Free Pascal are development tools, they're installed in several folders that you don't normally see in Finder. You can copy and save the commands below to file uninstallLaz.sh and run it if you need to uninstall Lazarus and Free Pascal. You can usually install newer versions of Lazarus and Free Pascal over older versions, but as with most software it's not a bad idea to clean out everything before you install a newer version. This list of commands should also give you a sense of where the various pieces of Lazarus and Free Pascal are located. Note that this assumes you have version 2.2.2 snapshot of Free Pascal installed. If you have a different version, change the two relevant commands to specify your version. Then enter your password when prompted. FPC 2.4.4 has a bug. You can not compile the IDE with the range check flag -Cr. Windows Programming Tips - Desktop Windows programming tips. Mac How - If you having troubles in solving some major issues. This page was last modified on 20 February 2019, at 12:34. This page has been accessed 120,322 times.